Black Friday & Cyber Monday 2015. 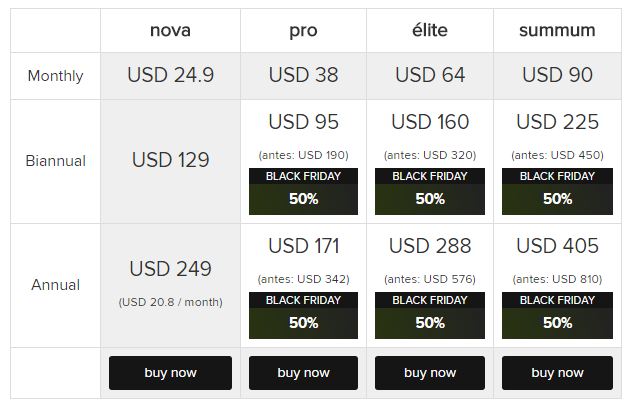 | Blog - Gigas The Cloud Computing Co.
Gigas Black Friday: The Best VPS at the Best Price. You wanted discounts? Black Friday is already here! Within the next 4 days, get the best VPS at the best Price. From Friday November 27th at 00:00 to monday 30th at 23:59 (GMT+1). Products and billing cycles applying in this promotion. What does this discount means to your pocket? Whit this discount , you go even further with the cost savings that usually get using our services. Compare and save signing on now. *Discount only applying the first billing cycle. Go to Gigas Cloud VPS section. Select the Cloud VPS product (Pro, élite o summum) you want to get. Choose Biannual or annual billing cycle. If you have any doubt, our Support department will be happy to help you 24 hours a day. Don’t let this oportunity go. Four marvelous days! Once the first billing cycle is finished, the renovation prize will be the one applying at the moment. This promotion can not be combined with other discounts or promotions. In orther to take advantage of this promotion the coupon code must be introduced at purchase page. Clients with pending bills can not join the promo.